The passionate artistry of violinist LINDA MELSTED has won the hearts of audiences across North America, Europe, and Japan. She has appeared as soloist, member, and leader of several outstanding ensembles including Tafelmusik Baroque Orchestra, Freiburg Baroque Orchestra, Portland Baroque Orchestra, Seattle Baroque Orchestra, Pacific Baroque Orchestra, and Pacific Music Works. Linda is the featured soloist in Tafelmusik’s documentary “Le Mozart Noir.” An active chamber musician, Linda has appeared on many series including Early Music Vancouver, Gallery Concerts, Folia, and Toronto Music Garden. 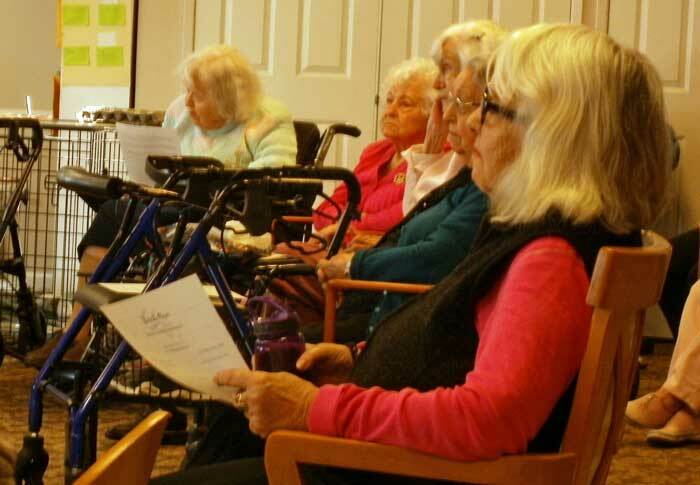 She is co-founder of the new group sound|counterpoint and Salish Sea Players, a group dedicated to performing in retirement and nursing facilities. She regularly performs with Marc Destrubé and Friends and Early Music Underground. Linda is the director of the New Baroque Orchestra, Seattle’s community Baroque orchestra. Linda performs on a Nicolo Amati violin. Born and raised in the Seattle area, KAREN FARDAL began cello studies at the age of five. As a soloist, chamber musician, orchestral player and chorus member, she has performed in the US, Israel and throughout Europe, including concerts with the Berlin Philharmonic, on BBC Radio and with the Merce Cunningham Dance Company. As a Baroque cellist, she has performed and recorded with the Seattle Baroque Orchestra, Seattle Early Dance, Columbia City Baroque and the New Baroque Orchestra. Recent ensembles include Octava Chamber Orchestra, the Seattle Rock Orchestra, Scrape, Thalia Symphony (principal cello) and the Geetanjali Band (playing Tamil movie music). Karen is a professional gardener, the mom of a teenager, a slowly-progressing knitter and human companion to a dog-like cat named Edwin. She is immensely grateful to all of her teachers, mentors, and collaborators for many years of life-enriching musical experiences. A versatile performer on early and modern keyboard instruments, JONATHAN ODDIE has performed as a soloist and continuo player in the United States, England, and Germany. Jonathan holds degrees in piano and harpsichord from the Indiana University Jacobs School of Music, where he studied harpsichord with Elisabeth Wright and piano with Jean-Louis Haguenauer and Edmund Battersby. Jonathan has been a member of the orchestras of Pacific MusicWorks, the Bloomington Early Music Festival, the Aston Magna Festival, and Oxford Baroque. He is currently finishing a doctorate in musicology on the instrumental music of Orlando Gibbons at the University of Oxford. BYRON RAKITZIS, violinist, has had a lifelong fascination with baroque music and baroque instruments. He has performed at one time or another on the flute, oboe, violin, recorder, and bassoon with orchestras and ensembles on the West Coast. Byron lives on Capitol Hill with his beautiful wife and four lovely children. He also adores cats even though he is presently cat-less. MIYO AOKI is a dedicated recorder player and teacher, performing music ranging from medieval to modern and teaching students of all ages and levels. She has performed in the US, Germany, and Poland with groups including Fortunata, Utopia, and Gamut Bach Ensemble, and is a founding member of the Seattle-based group sound|counterpoint. She has premiered works by contemporary composers Natalie Williams, David Schneider and Agnes Dorwarth. Recently, Miyo completed a KAZ Diplom (Artist Diploma) at the University of the Arts in Bremen, Germany, where she studied with Professor Han Tol. While living in Bremen, she also maintained a private studio and worked in the musical outreach program “Musik-im-Ohr”, based in the Bremen concert hall, Die Glocke. She holds degrees in both early music performance and mathematics from Indiana University, where she studied with Professor Eva Legêne and taught as an Associate Instructor in the Pre-College Recorder Program. CURTIS FOSTER, Baroque oboe and recorder, whose playing has been praised for its “brilliantly introverted charm” (Seattle Times), has appeared as soloist and member of many outstanding groups, including the Seattle and Pacific Baroque Orchestras, Pacific Music Works, Mercury Baroque, the Newberry Consort, Victoria Baroque Players, and others. Festival Performances include the Vancouver, Chicago, Pacific, and Bloomington Early Music Festivals, Ottawa International Chamber Music Festival, and the Phoenix Bach Festival. A ravenous chamber musician, Curtis has performed with small ensembles in concert from San Francisco to Dubai. Mr. Foster is also a strong advocate for music of our own time, and has commissioned and premiered many works by contemporary composers for old instruments. Mr. Foster has recorded for ATMA Classique, Cedile Records, and IU Press. A native of Wichita, KS, Curtis now makes his home in Seattle. He is a graduate of Indiana Uniiversity’s Early Music Institute. Before moving to the Seattle area, OLGA HAUPTMAN performed regularly with such groups as The Ensemble for Early Music’s Grande Bande, ARTEK, Concert Royal, Brandywine Baroque, American Bach Soloists, and NYS Baroque. Since then she has appeared with baroque orchestras in Seattle, Portland, and Vancouver, and in the all-day Bach and Schubert events at Town Hall Seattle. She has appeared at the Hong Kong, Berkeley, and Connecticut Early Music Festivals. Olga participated in a critically acclaimed recording of Monteverdi’s “Orfeo” with ARTEK on Lyrichord CDs. She has also recorded for Koch International, Music Masters, Vox, and Wildboar. She is a founding member of Mercure Galant. FRED HAUPTMAN was a member of the Music Faculty at City College of New York from 1965-1999. While on leave in 1988-90, he lived in Seattle where he founded and directed the Versailles Ensemble and was a writer on music and concerts for the Seattle Weekly. Since his return to Seattle in 1999 Fred has served as Music Director for Town Hall, where he produced a variety of concerts including Town Hall’s series of Bach Around the Clock marathons and a similar all-day Schubert event. He has also worked with the Early Music Guild as a board member and as Music Director of EMG’s opera productions. Fred is a founding member and keyboardist of Mercure Galant.